What type of SDP cannot be configured in an l-VPLS? Which of the following describes the setting of the l-SID on the Alcatel-Lucent 7750 SR? label to determine the I-VPLS. TheI-SID is always set to the service-id by default. 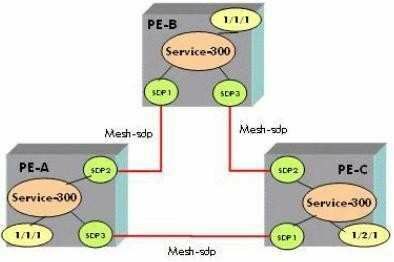 What option is available when using PBB to reduce the amount of required VPLS services? The Alcatel-Lucent 7750 SR supports 1:1 mapping of I-VPLS services to B-VPLS services. The Alcatel-Lucent 7750 SR supports 1:1 andM:1 mapping of l-VPLS services to B- VPLS services. Which of the following is NOT a feature of the IEEE 802.3ah EFM standard? Discovery and auto-negotiation of OAM capabilities. Latency and jitter across a service. Link monitoring via event notifications. declaring the ports are up? The device will try to force the other side up using the evaluating flag in the PDU. The device will detectthe port change and revert to discovery mode. The device will wait for the trasmit-interval of 5 before trying to rediscover the neighbor. The device will detect the port change and will wait for normal operation mode. Multicast frames only forward out ports that have a known receiver. 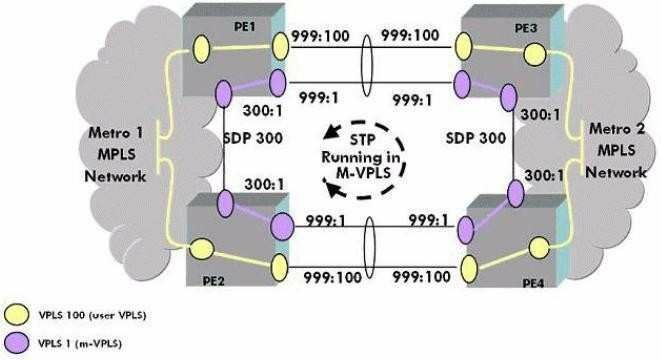 If the FDB has an entry for the unicast frame, both unicastand multicast are treated equally. Unicast frames only forward out ports that have a known receiver. If the FDB is empty, unicast and multicast frames are treated equally. Click on the exhibit below. Given the following output what is the most likely reason the SDP binding is operationally down? The sdp id is different on the far-end. The vc-id is different on the far-end. LDP is disabled on the far-end. The mesh-sdp is missing on the far-end. service? 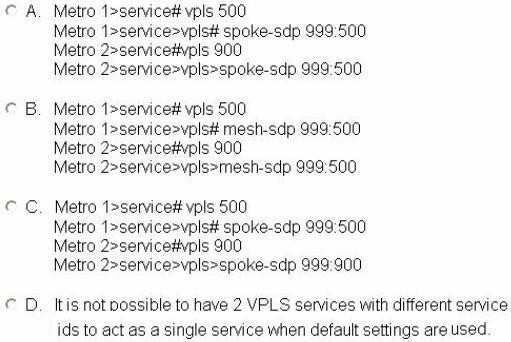 Assume default values for all VPLS parameters and SDP 999 exists between the metro networks. 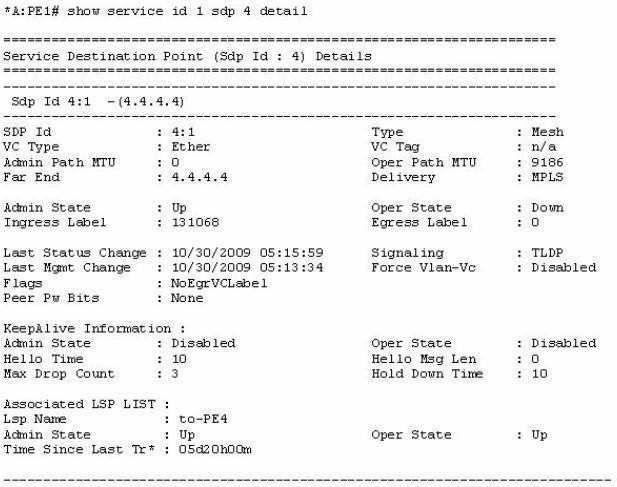 service on the Alcatel-Lucent 7750 SR? The overhead consists of 14 bytes for DLC. connected to PE-C. The ping is successful. Which of the following statements are true? The FDB on PE-A will contain entries for all CE routers. The FDB on PE-B will contain an entry for the CE router connected to PE-A. The FDB on PE-B will contain an entry for all CE routers. Which SDP on R3 will MAC addresses be associated with for devices behind R2? It depends if traffic is received via R4 or R1 from devices behind R2. Devices behind R2 will be associated with the sdp between R3 and R4. Devices behind R2 will be associated with the sdp between R3 and R1. Which of the following SAP encapsulations supports only one service on a port? following is the correct SAP id for PE-B? What is the MTU impact on the SDP path-mtu if fast reroute facilities-mode is implemented on the LSP? There will be no impact on the path-mtu. The path-mtu will increase by 8 bytes. The path-mtu will decrease by 8 bytes. The path-mtu will decrease by4 bytes. The path-mtu will increase by 4 bytes. Broadcast traffic will be dropped. If the unicast DA has not been learned in the FDB,the frame will be dropped. Broadcast traffic will be flooded. If the unicastSA has not been learned in the FDB,the frame will be dropped. All traffic will be dropped, including multicast and broadcast. What is the result of initiating an oam mac-ping to an unknown unicast MAC address in a VPLS instance? The oam mac-ping will fail. The MAC address must be known in the local FDB to be successful. 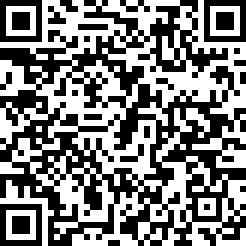 All nodes will reply because the oam mac-ping is flooded. specified MAC address on a local SAP. The request will be flooded and the CE device with the corresponding MAC will reply. forwarding to redirect traffic to a Layer 2 DPI device? What needs to be configured in a VPLS in order to forward customer STP BPDUs transparently? 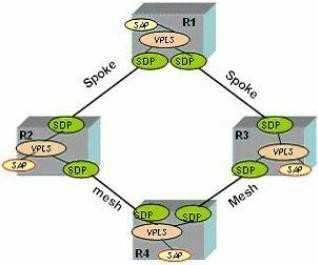 Spanning tree must be enabled within the VPLS. Spanning tree must be disabled within the VPLS. Spanning tree BPDUs must be untagged. Spanning tree BPDUs must be tagged.